With the debut of the Nissan Note, an innovative new small family car, the Micra C+C, a chic coupé/convertible and the new sporting Micra 160SR, Nissan is using the Frankfurt Motor Show to showcase its strengthened range of small cars for the European market. 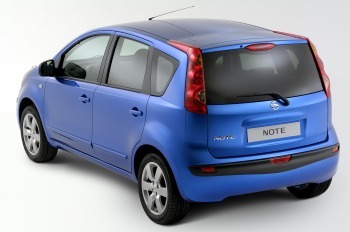 The new Nissan Note is a roomy five-door hatchback that combines innovative styling and practicality with a strong sporting flavour. It is aimed at parents who have a need for a car to match their busy lives, but who don’t want to stop having fun behind the wheel. The Note has a dynamic stance and distinctive styling cues, which will appeal to buyers who have always considered design as an important priority when they’re shopping for a car. But good style and fun to drive does not mean that the Note cannot meet the needs of busy families with a limited budget. Inside, there is a vast amount of space thanks to the wheelbase of 2600mm – longer than that of a VW Golf - and the space can be maximised thanks to folding rear seats, as well as a sliding rear bench. There will be four engine options: two 1.5 dCi diesels developing 50kW and 63kW (68 and 86 PS) respectively, a 1.4-litre 65kW (88PS) petrol unit and a new 1.6-litre 81kW (110PS) petrol engine found in the new Micra 160SR and C+C. Customer deliveries will begin in Europe in the northern spring 2006. With the Frankfurt Motor Show debut of the Micra C+C, Nissan is ready to open the latest chapter in the Micra success story. Thanks to its clever folding roof, Micra C+C allows owners the best of both worlds: fresh air when the weather allows and hardtop protection when it’s inclement. But Micra C+C introduces another ingredient to the mix, one that’s unique in its class – the roof is all glass, so the elements can be enjoyed even in the depths of winter. 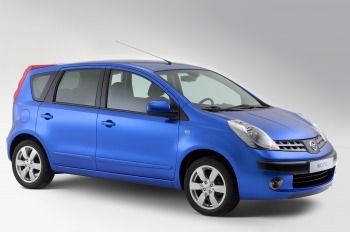 Undeniably elegant, Micra C+C is lower and longer than the hatchback Micra. The roof line, dictated by the steeply raked windscreen, is 110mm lower than on the conventional car while Micra C+C is 90mm longer overall: the extra length is all to the rear of the car where it provides the extra room needed to stow the hardtop behind the rear seats. The hardtop itself is a work of art. With a one-touch operation and automatic latching and un-latching, it takes just 22 seconds to fold clamshell-style beneath the double-hinged boot lid. 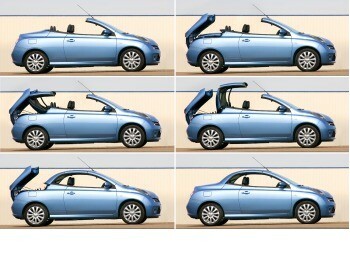 With the roof folded, luggage space is a class-leading 225 litres and that grows to 457 when the roof is up. 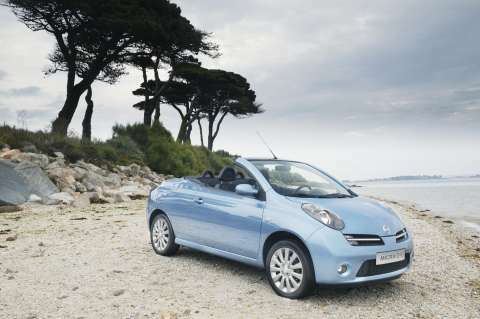 The C+C is powered by a 1.4- and a new 1.6-litre petrol engine which is also used in the new Micra 160SR. Customer deliveries begin in in Europe in November. The culmination of a two-year project to develop a range-leader which would add spice and dynamism to the Micra range, the 160SR will satisfy enthusiastic drivers. Central to the 160SR’s character is the brand new 1.6-litre 16 valve four cylinder twin cam which develops 81kW (110hp) and 153Nm of torque. The engine gives the 160SR class leading performance with a top speed potential of 183 km/h (114 mph). Standing start acceleration sees the 160SR reach 100 km/h (62 mph) from rest in just 9.8 secs. To produce sharper, sportier handling the suspension has been stiffened and the power steering modified to give greater feel and feedback. In addition, electronic stability control has been made a standard feature. Nissan is now developing a retro-fit Diesel Particle Filter and its maintenance service method at dealers, and plan to make these available before the end of 2005 for both Pathfinder and X-TRAIL in Germany.